Luxury mooring ropes for super-yachts in Spain. 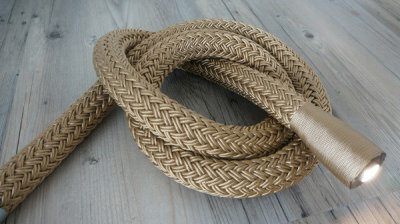 High quality ropes for yachts: strong, soft and flexible ropes with a superior finish. An extensive range of colours to match your hull colour or ships style. 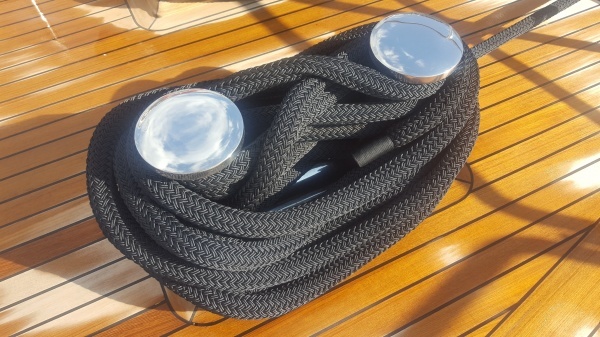 The Beaufort range: a double braided Polyester line with a finish suitable for every superyacht. Diameters up to 72 mm. with a breaking load of almost 102 tons. 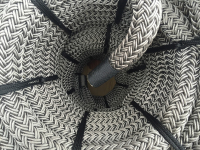 the cover is 16 or 24 braided, depending on diameter of rope. A 12-strand braided core gives the strength to the rope. The Beaufort is a very flexible line with a high breaking load. Available diameters from 10 to 72 mm. OCEAN 12 range: an 12-strand braided polyester rope. Easy to splice and very flexible. Diameters up to 36 mm. OCEAN 8 range: an 8-strand braided polyester rope. Up to 128 mm. with a breaking load of more than 210 tons. ropes and other applications where low elongation is desirable. Diameters available: between 6 and 52 mm. colour for a very long time. control lines, woven cord and flag lines. For every rope or line application on your ship we have a product and a solution. feature that an owner or guest will see when arriving at the yacht. look and with the safety that this market requires. splicing on an eye with leather protection. or carbon look, other colours are available on request. We will match the whipping and leather eye protection to the colour of your lines. Ropes can also be purchased by spools of 200 mtr.